Rubbish bin, trash can, waste paper basket, whatever you want to call it, we have them on this site. Kitchen bins range from built-in to soft touch in a range of colours and finishes, including plastic and steel. The other stylish bins for bedrooms, the lounge or office come in mesh, willow, seagrass, faux leather and wicker finishes. Waste bin suppliers include John Lewis, Littlewoods and Sainsburys. 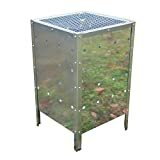 60L LITER Metal Galvanised Garden Incinerator Fire Bin Burning Leaves Paper Wood Rubbish Dustbin Made In U. K.